Win2PDF Pro supports the standard security options and permissions available in the PDF file format. Note: security options and permissions are not valid for the PDF/A file format. The "Encryption Level" setting controls the type of encryption used in the PDF file. 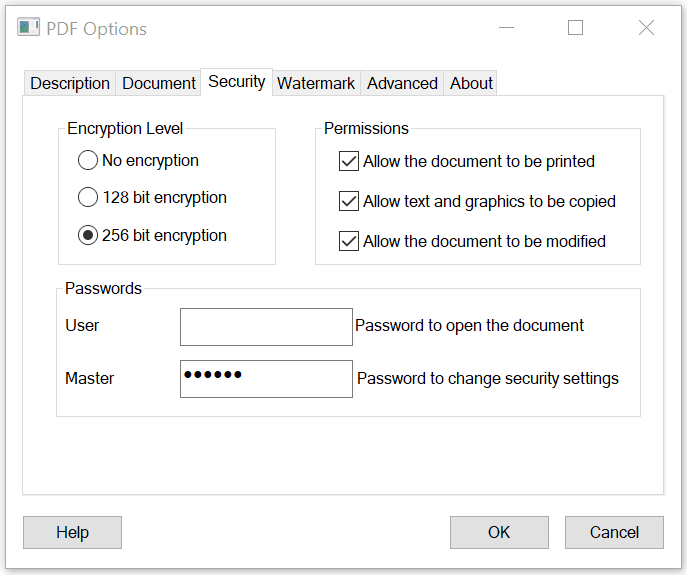 The 128 bit AES encryption is compatible with Acrobat Reader 5.0 and above and the 256 bit AES encryption is compatible with Adobe Reader 9.0 and above. For best security, the 256 bit encryption option is recommended. The "Permissions" setting controls restrictions that can be placed on the PDF file. To prevent printing of a PDF file, uncheck the "Allow the document to be printed" option. To prevent the text and graphics from being copied from the PDF file, uncheck the "Allow text and graphics to be copied" option. To prevent the document from being modified in a PDF editor, uncheck the "Allow the document to be modified" option. The PDF file format allows two types of passwords, a user password and a master password. The user password is used to open the document, and the master password used to encrypt the security options. When a user password is set, Acrobat Reader displays the following prompt when you open the PDF file. You must always enter a master password when security options are enabled. It is recommended that passwords be at least 8 characters long and contain at least 1 number. Information on controlling the encryption options from a custom application is available in "controlling encryption options" in the developer information section.